We got up late from our hotel in Munich and took a the Railjet train to Salzburg. This high-speed train connects Munich with Budapest and I kind of wished we were travelling on to Hungary. I had previously been to Salzburg in the summer of 1995, but this was Laura’s first time to Austria. 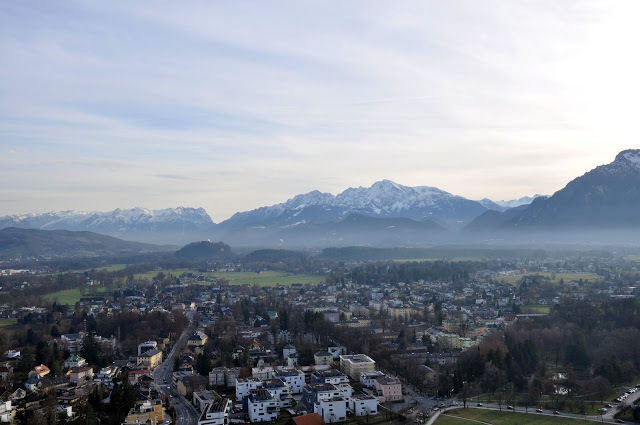 Salzburg, like Munich, sits in the foothills of the Alps. 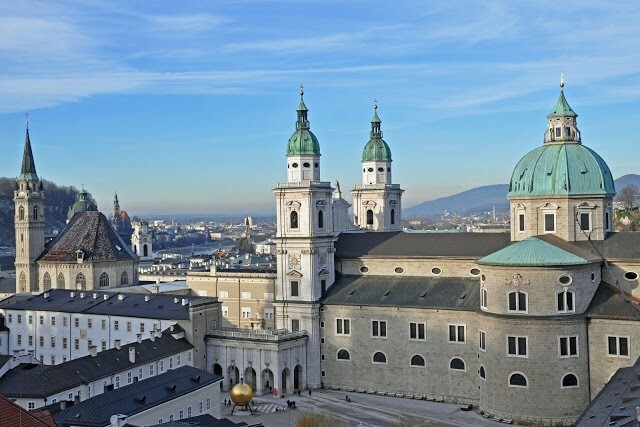 In addition to its charm, Salzburg also gave us the great Wolfgang Amadeus Mozart (for which I am grateful)…and The Sound of Music (for which I’m not). Salzburg is wonderfully delicate little town along the river. 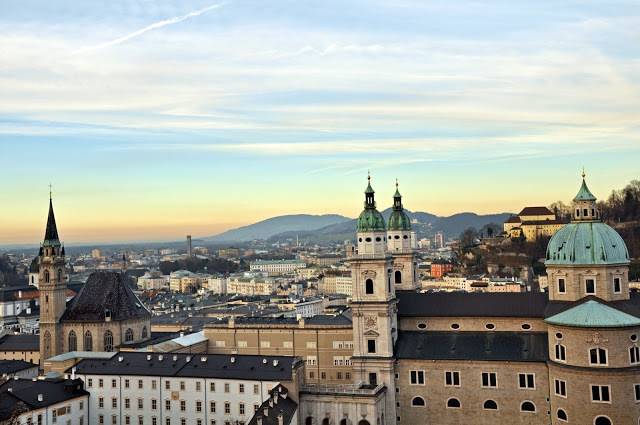 For this historical importance and charm, Salzburg’s city center is a UNESCO World Heritage Site. We arrived at the Salzburg train station, which rather resembles Baghdad right now – it is undergoing a complete re-build. There, we purchased our Salzburg Cards at the Tourist Information Center and then took a taxi to our hotel, the Hotel Am Dom. The Hotel Am Dom sits right off the main square down a small, pedestrian-only alley called Goldgasse. This hotel is downright funky. Our room reminded us a lot of a New York boutique hotel. I’d describe it as Elton John Goes to Austria. That sounds tacky, but the Hotel Am Dom is anything but. It’s quirky and eccentric…and really nice. We started our day with a Rick Steves walking tour of Old Town. We made it about three stops into the suggested route before heading off to lunch. We had lunch just of Getreidegasse at a place called Wilder Mann. It’s a classic Austian place serving up hearty fare in a simple atmosphere. You eat at shared tables. I had the specialty of the house – a Salzburger Schnitzel (pork) filled with bacon, onions and mushrooms. It was quite good, although very heavy and filling – like most food here. The ambiance was very charming and the service was snappy. All in all, a perfect place to dine for lunch. After lunch we intended to take the funicular up to the Hohensalzburg Fortress. Unfortunately, the funicular is now closed (I couldn’t tell if it was temporary or permanently, but they had imposing signs about it being closed and big heavy metal grates up – so it won’t be re-opening anytime soon). So, we did the long, strenuous walk up to the Fortress. I thought we both might pass out. 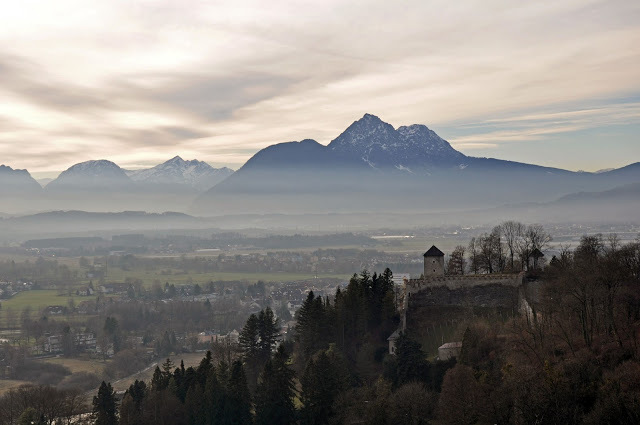 The Hohensalzburg Fortress is an impressive medieval fortification that towers over Old Town Salzburg. The views from the rampart walls are nice, but the view from the top tower (accessible only via the audioguide tour) was breathtaking. I love how Salzburg sits in this lush valley and the Alps tower to the South. The audioguide tour was informative and I enjoyed the Tower and the “torture chamber,” however, I don’t think it would be worth waiting in a long line for (such as in the summers). After the Fortress, we walked down and stopped at the Panorama Museum 1829. These Panorama paintings were common back in the period before photography and toured the world to promote tourism. The intense detail in the paintings, visible through telescopes is stunning. Also, given the museum’s proximity in town, it’s a nice central place to use a clean bathroom for free (assuming you purchased the Salzburg Card). If you didn’t, this museum is probably skippable. During the afternoon, we stopped at Cafe Tomaselli for a Coffee Melange. Dating from 1703, it is the classic Salzburg coffeehouse. Ironically, smoking is still permitted inside. It is so unusual to see this practice permitted in public spaces in a Western society. (Judging by the coughing of the old men who work here, the second-hand smoke has taken its toll on their health). 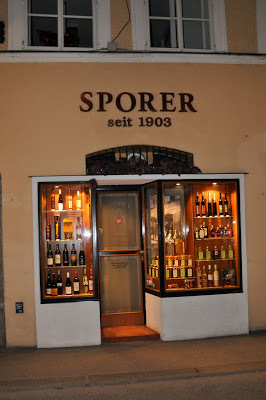 Down on Getreidegasse we found Sporer, an ancient store that makes liquors and brandies. We had seen it on several travel shows on TV and just had to go. We sampled nearly 10 different liquors and particularly loved the apricot and the elderflower (nearly identical to St. Germain back home). Laura bought bottles of apricot, elderflower and cacao to take home. Long-time readers of this blog will know that I’m on a tour of the world’s greatest hotdog stands. From Brooklyn to Iceland, I search the best meat in tubular form. And Salzburg, Austria, has a top contender: Balkan Grill (the sign in the passageway says Bosna Grill). I claim this to be one of the world’s greatest hotdog stands. And I can back that up. First, the stand has only 5 menu options (hotdogs with mustard, ketchup, curry spice, onions, and parsley in varying combinations). The #2 (with mustard, parsley, onion, and curry spice) is considered the “classic” and their biggest seller. The #5 with ketchup is the kids’version. Also, at Balkan Grill you get 2 hotdogs (which taste like bratwurst, but are small like hotdogs) on one bun! The bun looks like a standard hotdog bun that has gone through a panini machine. Balkan Grill is one of the world’s greatest hotdog stands. Period. End of discussion. Later in the evening, we had dinner at the K+K Hotel Restaurant. Decorated in soft pine wood, this restaurant serves up first rate food that is both homey and refined. We had a delightful server named Nina, who was just fun. We started with a bottle of the Gruner Veltliner wine. Then, we both had large bowls of the pumpkin soup for starters (it was less heavy and more brothy than you expect in the U.S.). I opted for the pepper steak, which was excellent, except the spinach soufflé ball (not good). To conclude, we shared the light chocolate mousse dessert, which was also good. After dinner, we finished the Rick Steves’ walking tour and took photos of the important sites in Salzburg all illuminated at night. What do you think about Wintery Day in Salzburg, Austria? We found your blog a couple of days ago, while searching for a guesthouse in north Iceland, and we loved it! 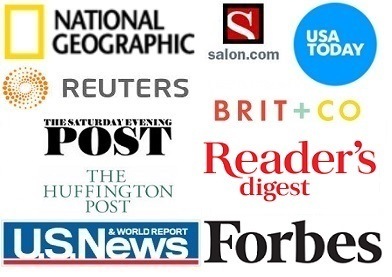 We read all your Iceland posts in an afternoon! We even printed them!! Very helpfull! 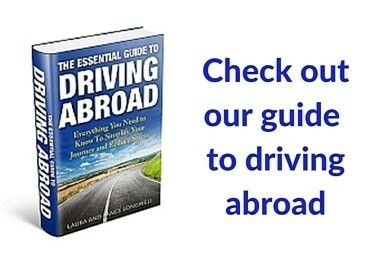 It mostly showed us that our travel plan is doable!!! By the way, your photos are great! !